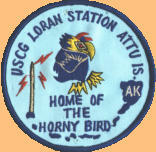 Attu’s LORAN Station activities are largely overlooked by many Aleutian studies which focus primarily on Attu’s role during WWII, forgetting the men of the Coast Guard and the efforts expended by them keeping NAVAIDS up and running both during and long after WWII. Long Range Navigation (LORAN) was a NAVAID, in part originally implemented on Attu at Theodore Point in September of 1943, which became operational in 1944. From that date and up to August of 2010 a contingency of some 20+ men on station a year at a time kept LORAN operational at each of the three sites (Theodore Point, Murder Point, and Casco Cove- Massacre Bay) the station had occupied over the 67 years of its existence. During LORAN’s operational presence on Attu the physical location of the station had been relocated from one location to another on three separate occasions ostensibly to provide better access to the facilities. These are the stories of men who’d served, largely unknown to the world, at Attu’s LORAN Station…where if you looked to the west from there you could see tomorrow!